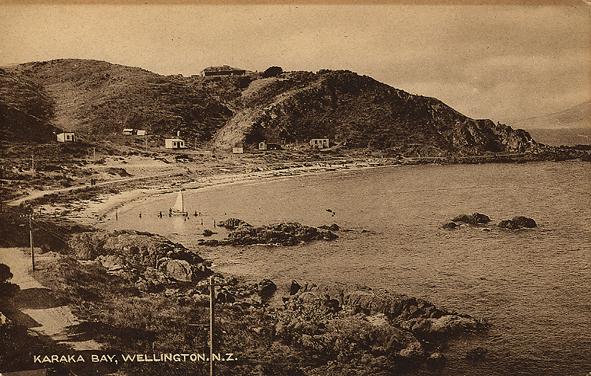 Miramar Peninsula, Wellington, New Zealand. 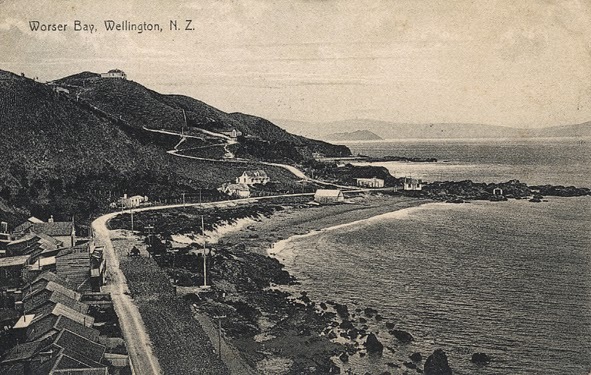 I began collecting New Zealand postcards because of my interest in early New Zealand photography, and decided to collect Wellington postcards. I soon found that this was going to a huge undertaking, so now I only collect cards from east of the Mt Victoria tunnel, ie: Hataitai, Kilbirnie, Rongotai, with my main interest being the Miramar Peninsula. This has the advantage of keeping the collection small, just a couple of albums, and to be selective on what cards to add. Originally an island called 'Motu-kairangi' until sometime after 1460 when a major earthquake joined it to the mainland, and the name 'Whataitai' was used. In 1840 surveyors divided the peninsula into 18 lots, 5 of which were purchased by James Watt, who never lived there, and the name 'Watts Peninsula' was adopted. 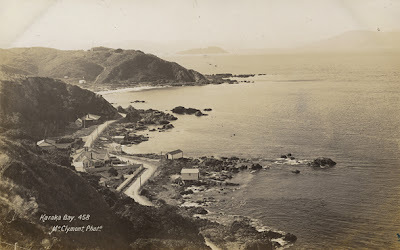 James Coutts Crawford purchased 500 acres, and was probably the first white settler on the peninsula. 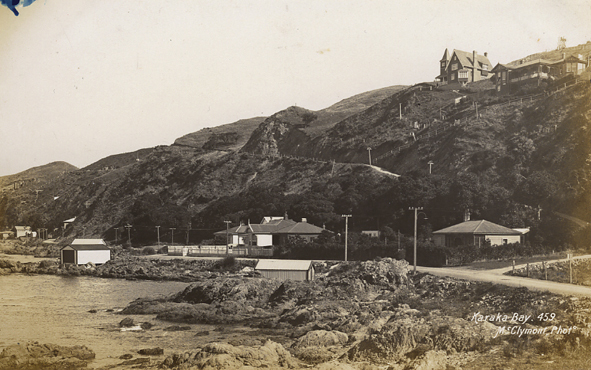 The name 'Miramar' was first used by Crawford's brother-in-law, Major McBarnett, to a house build by him in 1868 on a hill at the south-east of Evans Bay and later occupied by Crawford. 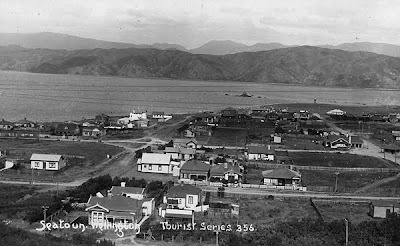 When the peninsula became a borough, it was given the name of the house. 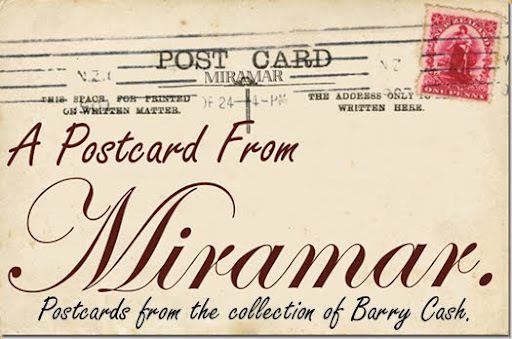 There are a number of books on the history of Miramar if you want to know more. 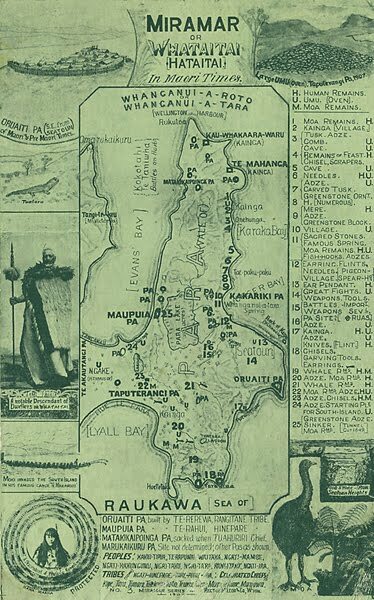 I recommend "Miramar Peninsula" (1975) by John Struthers, where most of the above information came from. 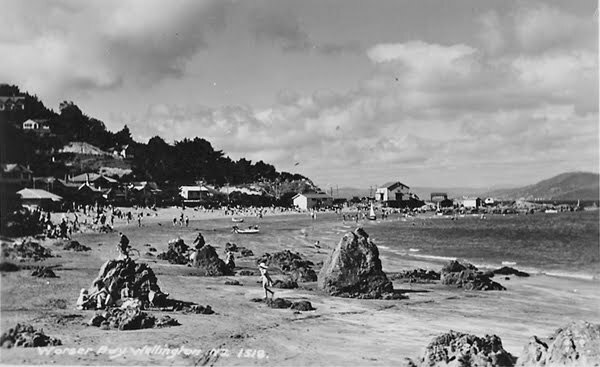 Other reading includes; "Early days on the Miramar Peninsula" (1981) & "On the edge of our city" (1984) by J.M & B.M.Kenneally, "Waka, Ferry, Tram-Seatoun and the bays before 1958" (2001) by Bob O'Brien, "TV, 4WD, WWW, Seatoun and the bays after 1958" (2003) by Bob O'Brien, "Early events from Seatoun to Sinclair Heads" (2009) by H.Gary Tonks. 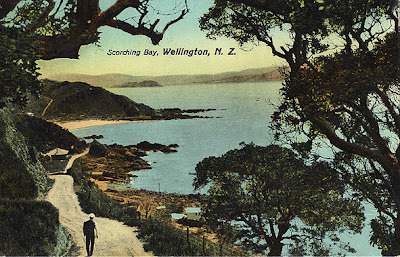 I am a member of the New Zealand Postcard Society. 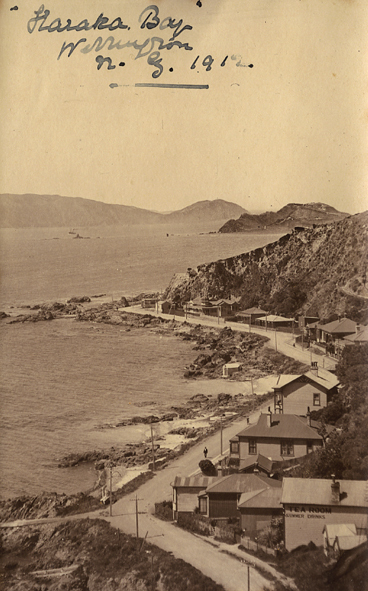 By the 1880's James Coutts Crawford had become the sole owner of all the land on the peninsula. 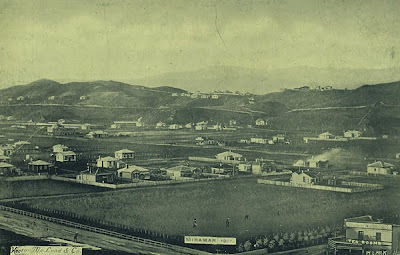 Between 1870 and the early 1900's Crawford's land was divided up into smaller lots and sold. 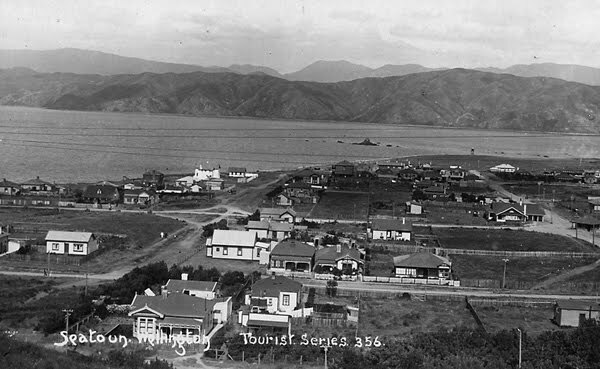 was formed in 1904, and in 1907 a tram line connected Miramar to the rest of Wellington. 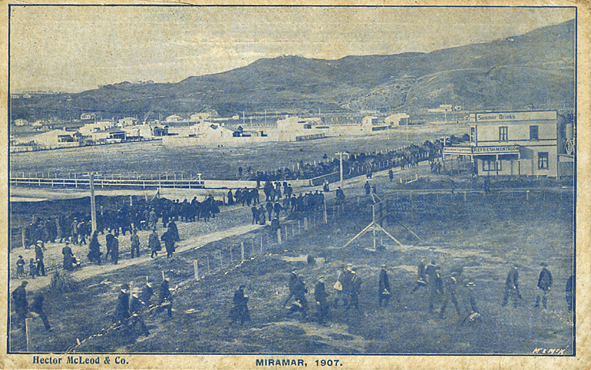 Miramar 1907. 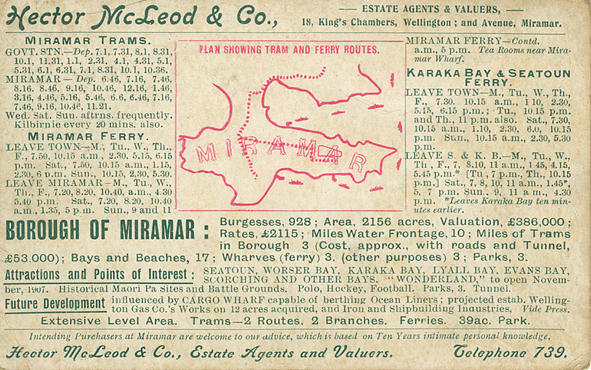 Hector McLeod & Co.
Hector McLeod & Co, Miramar Series No.3. 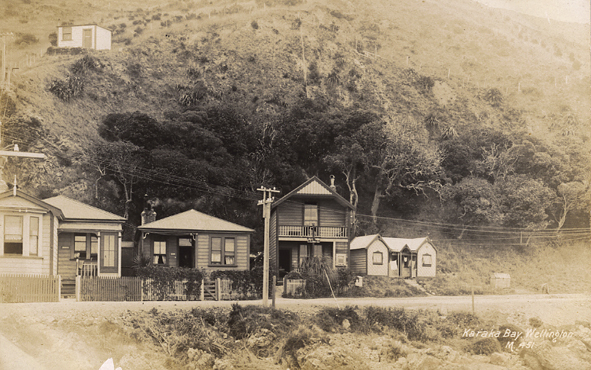 McLeod was a local estate agent, publisher, archaeologist, and Mayor of Miramar. Reverse of above card with timetable for trams and ferrys. 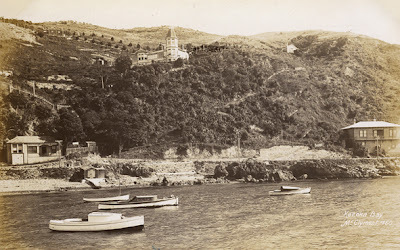 Miramar. 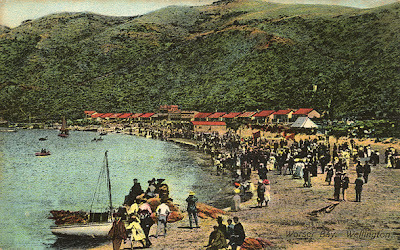 Tourist Series 2363. Frank Duncan & Co.
Card shows church at its original site above Tauhinu Rd. Miramar. 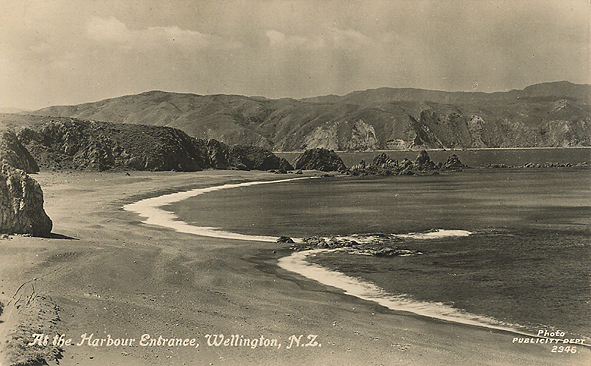 Aotearoa Series N1239. Hugh & G.K.Neill Ltd. Dunedin. I thank William [Bill] Main for his donation of this card to my collection. 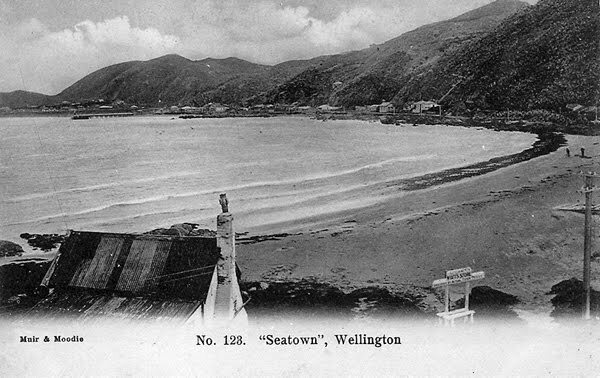 Seatoun was developed by James Coutts Crawford in 1879, and named after property owned by the Crawford family in the former county of Forfarshire (now part of Angus) in Scotland. Seatoun. Tourist Series 345. 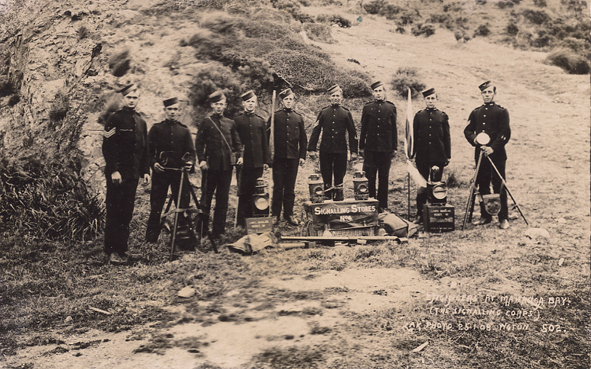 Frank Duncan & Co.
Seatoun. Tourist Series 356. 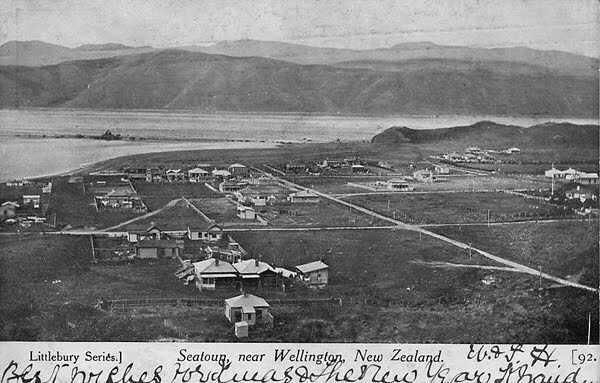 Frank Duncan & Co.
Seatoun, Wellington. Platin Series No.258. 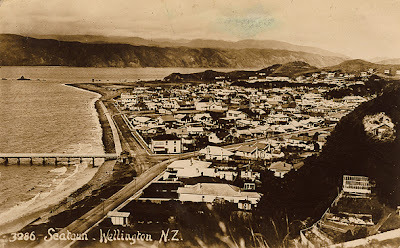 Pub by William Nees, Wellington. 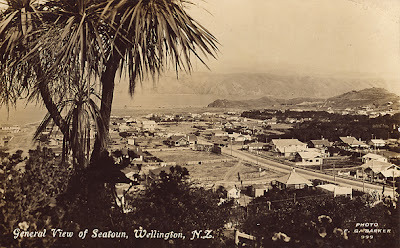 Seatoun, Wellington. Tourist Series 381. 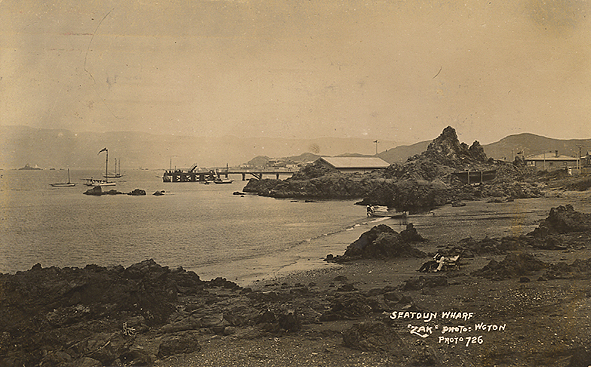 Frank Duncan & Co.
Harbour Entrance and Ferry Wharf, Seatoun. Platin Series No. 243. Pub by William Nees, Wellington. Seatoun. Tanner Bros Maoriland Photographic Series, 3286. Seatoun. 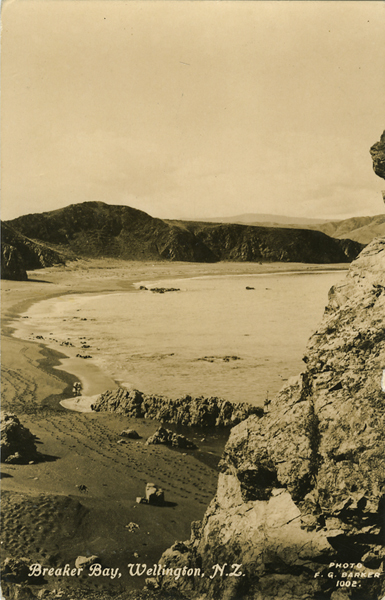 Tanner Bros Maoriland Photographic Series, 3282. Seatoun. Industria Series No. 5838. 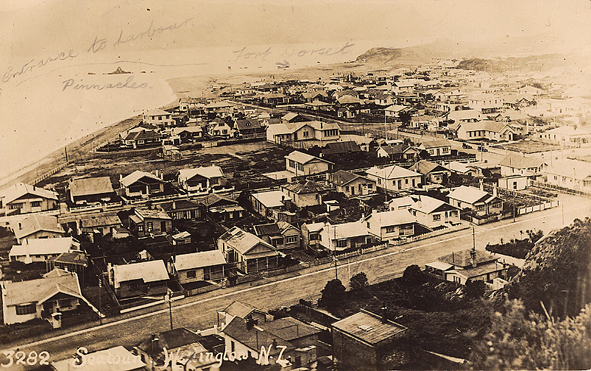 Fergusson Ltd.
Seatown. 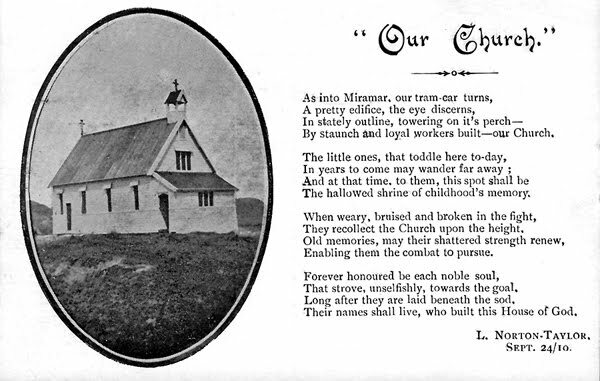 Muir & Moodie No.128. 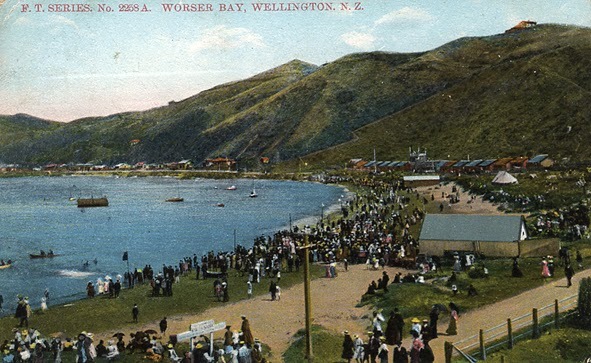 View is looking south from Worser Bay. 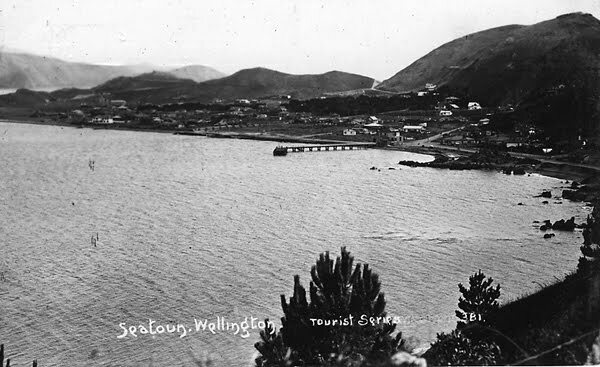 Seatoun Wellngton, Private card. Dated in ink on back 20.1.1919. 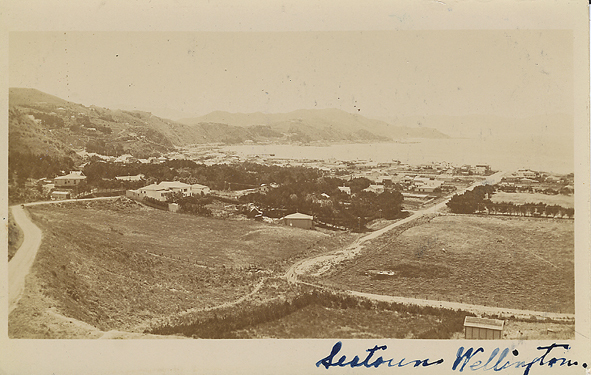 General View of Seatoun. F.G.Barker photo 999. 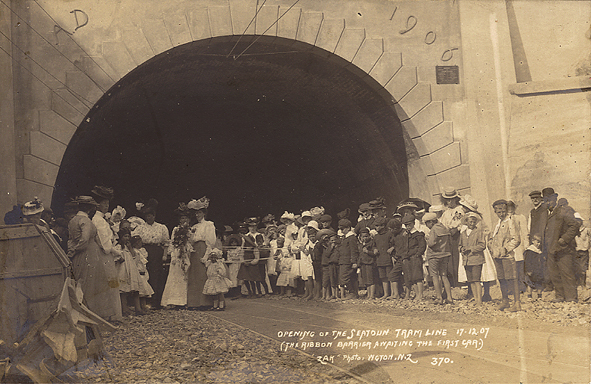 To extend the tram service into Seatoun, Council approved a loan of 23,000 pound for the construction of the tunnel. A contract for was signed on August 21, 1906 and the tram-line was opened December 17, 1907. There was only a single tram line in the tunnel, that branched out to double lines at both ends. Originally built with a footpath on both sides, the right side was removed in 1934 (I think) and the left side raised above road level. 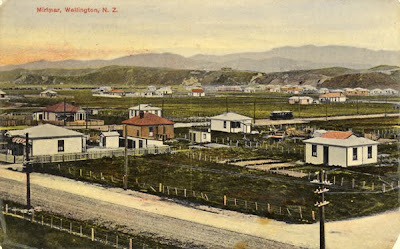 Trams continued to run until May 1958, when the connecting lines from Coutts Street, Kilbirnie were removed during the construction of Wellington International Airport, and the service was replaced by buses. 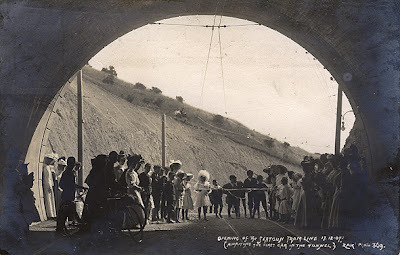 The tunnel is 470 feet long and 27 feet wide. Opening of the Seatoun tram line 17.12.07. "Zak" 370. Opening of the Seatoun tram line 17.12.07. "Zak"369. Seatoun Tunnel. F.T. Glossine Series No.4770. 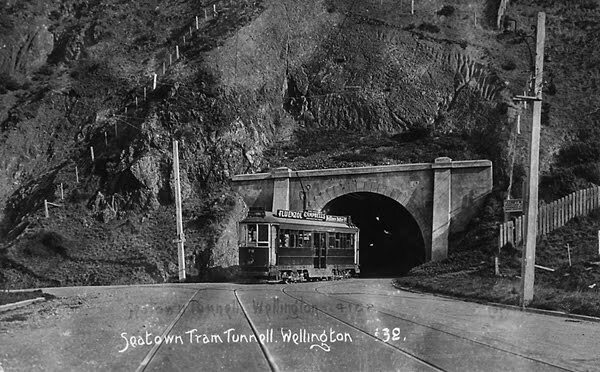 Seatown Tram Tunnell. Frank Duncan & Co. This photo has been used at least 3 times before going by the remains of previous titles. An original number is 4162, the number on this appears to be 32. 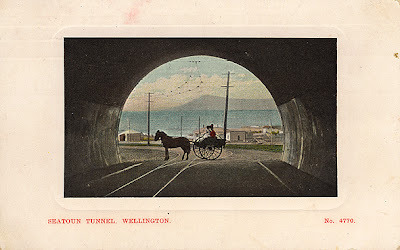 The mis-spelling of Seatoun as 'town', and tunnell, is repeated from earlier use. Tunnel was completed in Dec 1907. 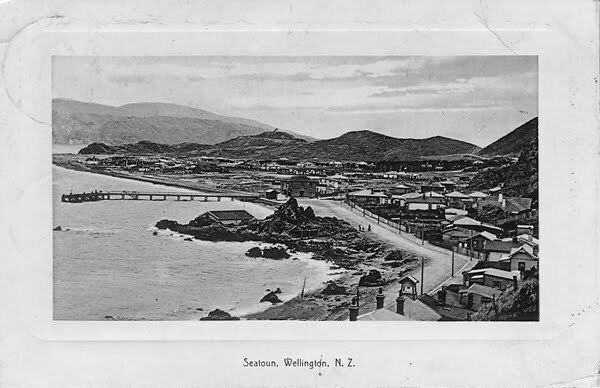 The site of a former air force base it has a long military history beginning in 1886 when the Submarine Mining Depot was constructed there in response to the "Russian Scare" (no minefields were ever lain). 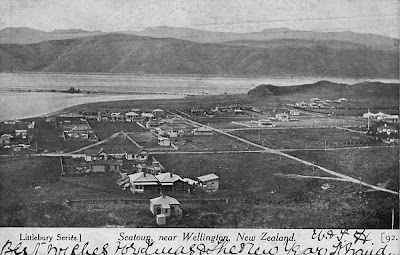 The Navy took over these operations and the base in 1907. 1914 saw the construction of a number of munitions stores in the hills behind the base. 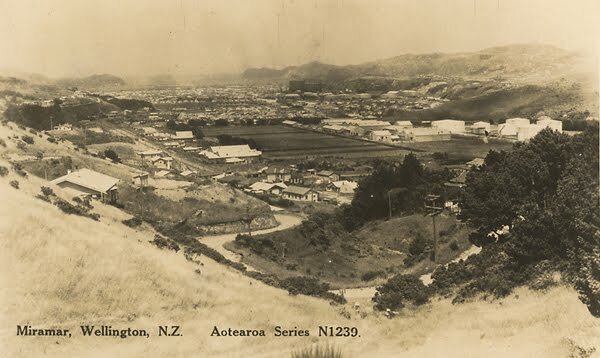 In 1942 reclamation work was started in the northern bay to provide more flat land for the base, which had been renamed HMNZS Cook. 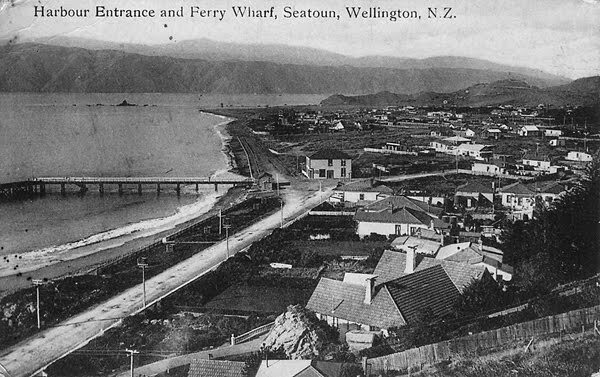 The wharves were also enlarged that year and the bay was dredged. Than in 1946 it was taken over by the RNZAF, and renamed Shelly Bay Air Force Base. 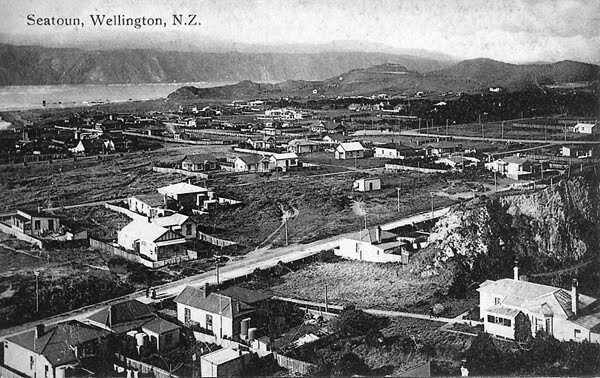 The base was used for administration and accommodation and was closed in 1995. 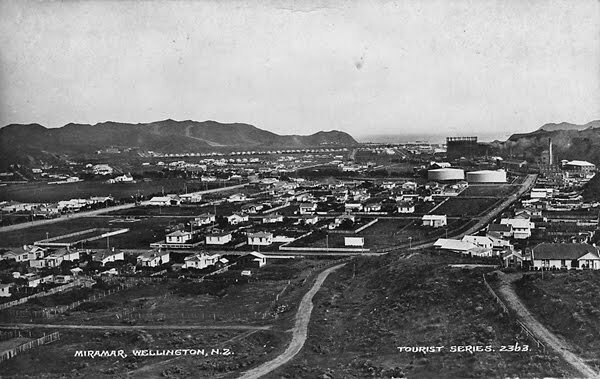 Since 2008 it has been owned by the Taranaki Whanui as part settlement to a treaty claim. The old base buildings are now being used by various businesses including an art gallery, cafe, children's art centre, and a film studio. The wharves have been in disrepair for some time and are not in use. The long term future of the site is at this time unknown. 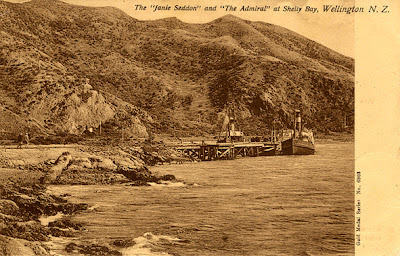 The 'Janie Seddon' and 'The Admiral' at Shelly Bay. Named after the groves of Karaka trees, planted by Maori, that grew in the area. The wharf here serviced both Scorching and Worser Bays, and horse carts went to both beaches, so for a fee, you didn't have to walk. Karaka Bay. Tourist Series 2361. Frank Duncan & Co.
Karaka Bay, with Wellington Heads in distance. 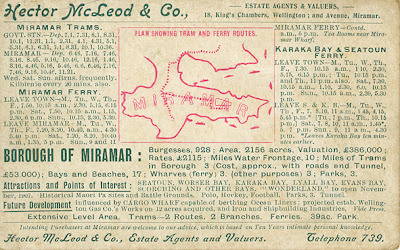 Maoriland Postcard, Tanner Bros, 88-114. Karaka Bay. F.T. Series No.416. 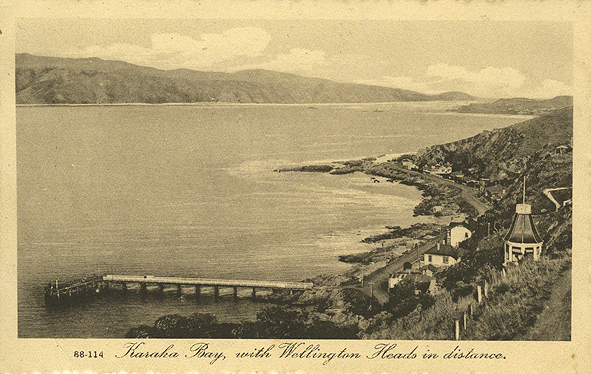 Panoramic View of Karaka Bay. Gold Medal Series No. 6906. 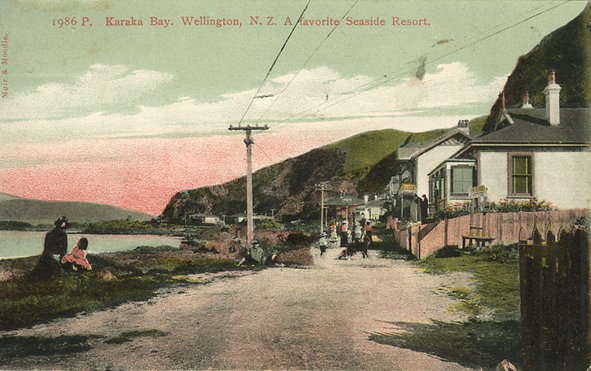 Karaka Bay, A Favorite Seaside Resort. Muir & Moodie, 1986P. 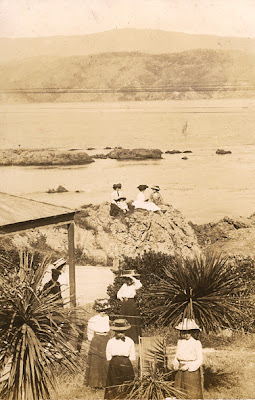 Picnic at Karaka Bay. Private card. 'Mr & Mrs Blackman whare' in ink on back. 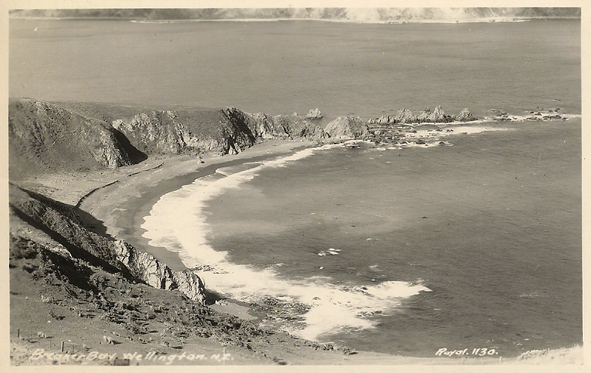 Hut at top left? The two story building is the tea rooms. 'Mrs Dougherty's house with tower' in ink on back. Karaka Bay, 1912. 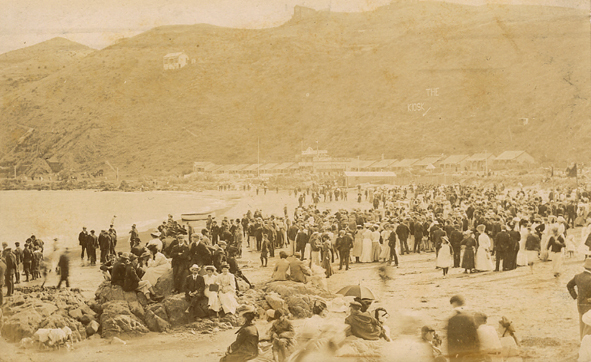 No photographer ID, Private card? 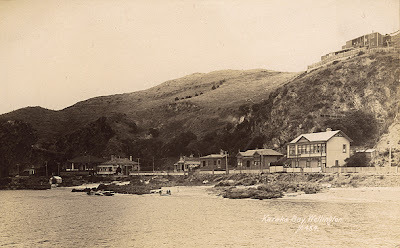 Note tea rooms bottom right. The site of a pilot station in the 1860's it was given it's name after pilot James Heberley's frequent comment that the weather was getting 'worser and worser'. 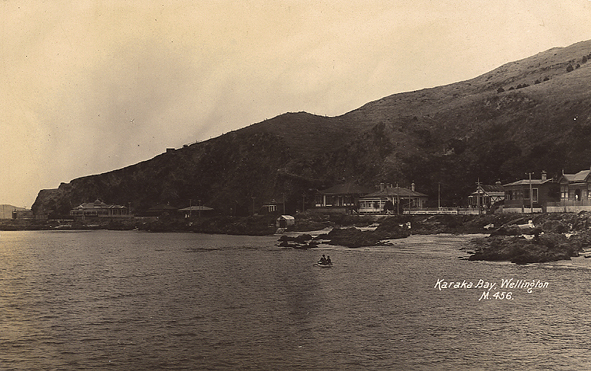 The original pilot's cottage is still standing at the bay. 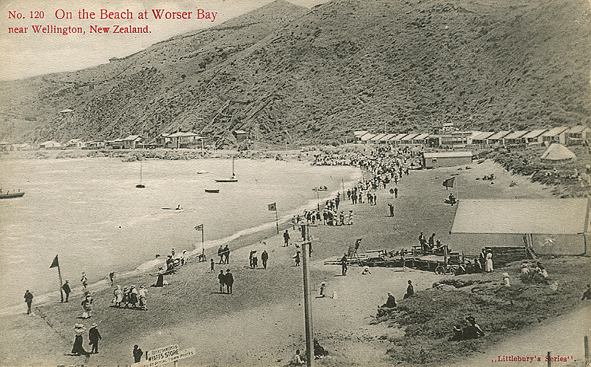 The bay is the home of the Worser Bay Life Saving Club (1910), and the Worser Bay Boating Club (1926). If you didn't want to use the ferry to get to the bays, a horse coach went from Wellington to Seatoun via the Worser Bay hill, (Awa Rd). Worser Bay School at the top of the hill was the first on the peninsular. The Evening Post of 1896 had adverts for furnished seaside cottages for rent at the bay, with the "famous Whangatura-a-Tara mineral spring on the property". 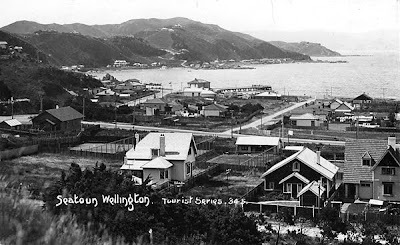 By 1906/7, Mr Robert Hearn and Mr Sampson Williams had built 9 more fully furnished three and four bedroom cottages for rent at twenty shillings per week. There was also a good dairy with goods at "town prices". The row of cottages, on both sides of the dairy in the middle, can be seen on some of these cards. 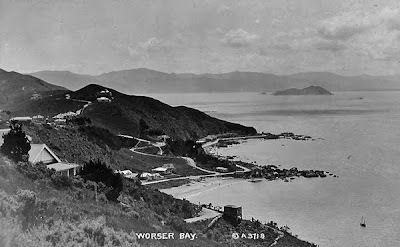 Worser Bay. 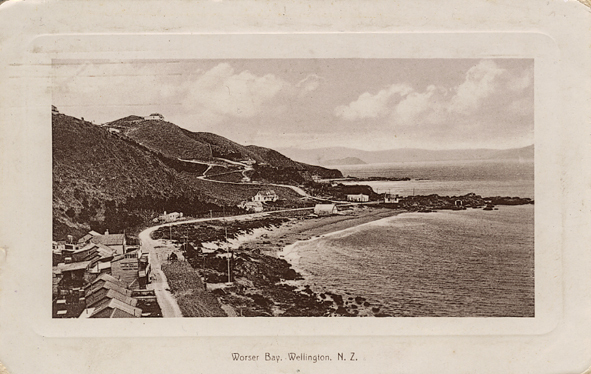 Industria series, No.5844, Fergusson Ltd.
Worser Bay. Gold Medal Series, No.15844, Fergusson Ltd. Submarine Explosion at the Worser Bay. 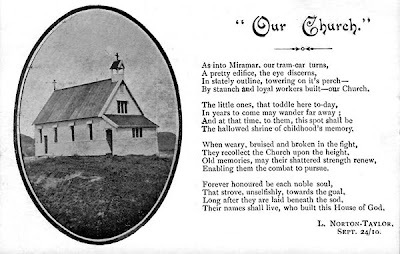 Littlebury's Series. 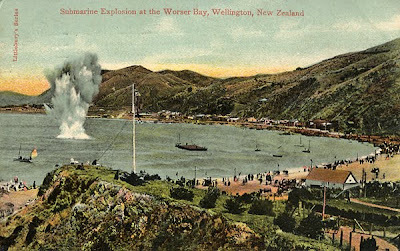 After the explosion there was a dead fish collecting competition. 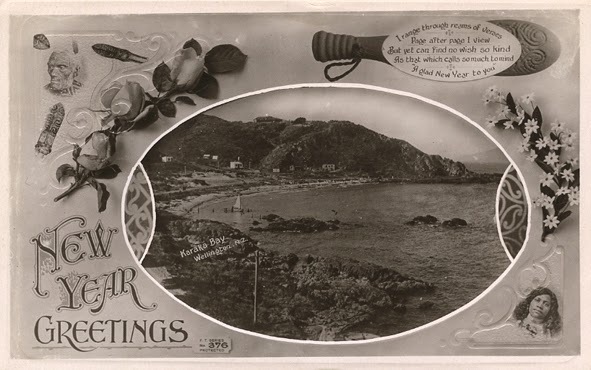 This card, and the four below, at the Anniversary Day Miramar Seaside Carnival, 22 Jan, 1908. Worser Bay. G & G Series 121. Worser Bay. No photographer or publisher. 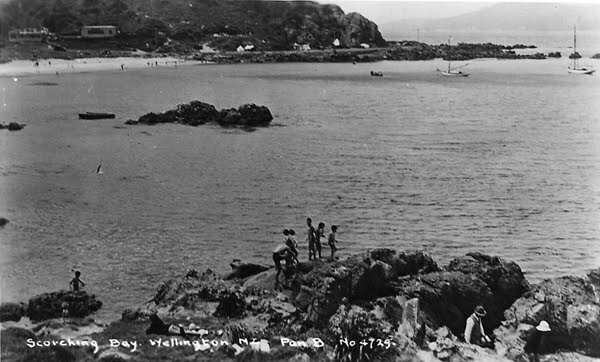 On the Beach at Worser Bay. Littlebury's series No.120. Scorching Bay. Maoriland, Tanner Bros, 306. 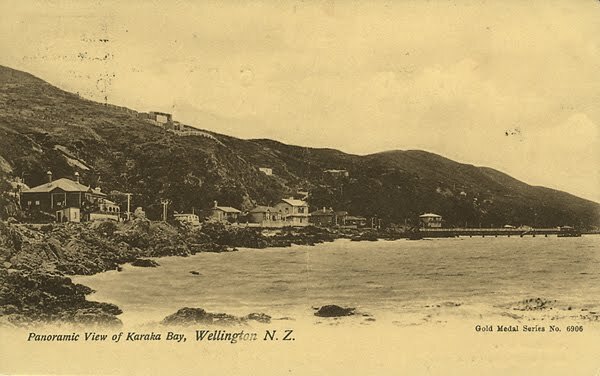 Karaka Bay. Tanner Bros No.145. 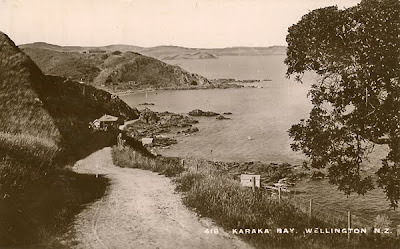 The card says Karaka, but this is Scorching Bay. Karaka Bay, 'New Years Greetings'. F.T.Series, No. 376. 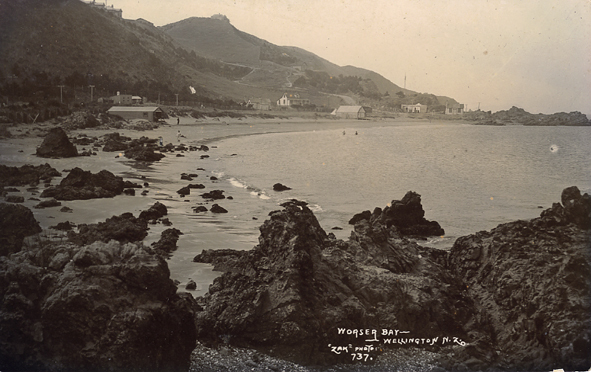 North of Scorching Bay, Mahanga Bay has a long history of military use. The wharf there was probably built about 1885-86 to bring ashore materials for the construction of Fort Ballance, and later used for supplies and landing troops. 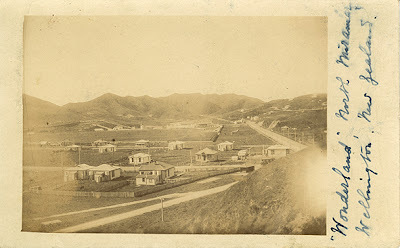 At this time most of Miramar North was military reserve and closed to the public. 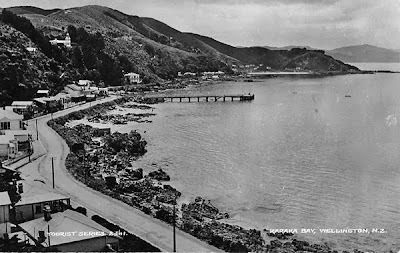 The Mahanga Bay wharf was demolished in October 1962 after being abandoned for many years. Today the bay is used by a NIWA research laboratory. Engineers at Mahanga Bay, (The Signaling Corps) 25.1.08 "Zak" 502. 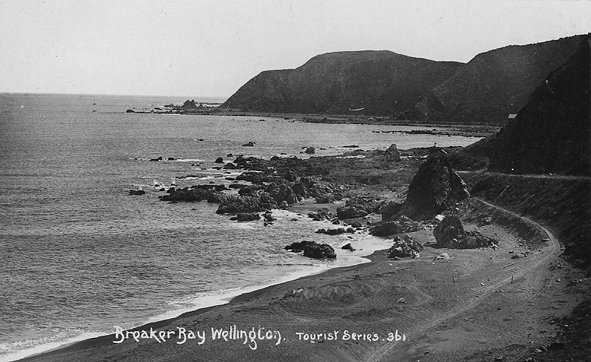 Access to Breaker Bay was at first only from Seatoun, over a rough track where the Pass of Branda is today. 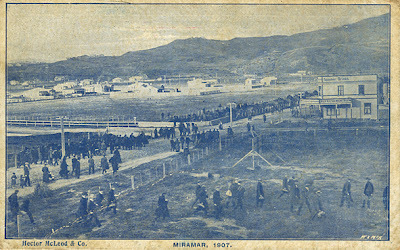 This track lead to a quarry where stone was dug for forming many of Miramar's roads. There are a number of bays along this coast, Eve, Flax, Reef, and Palmer Bays, which are now all generally called Breaker Bay. Over time some baches and cottages were built along this rough coast, with many builders having to remove rock from the cliff face to create a flat site. 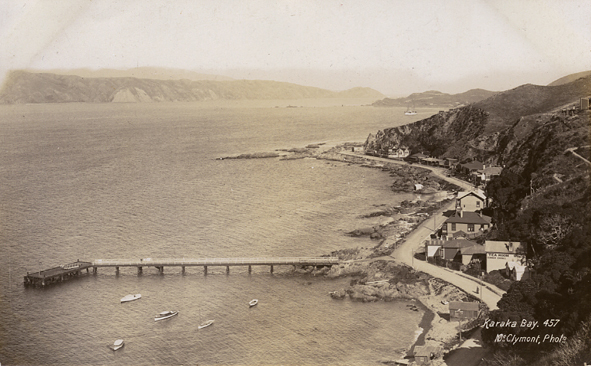 In 1924 there was a large sale of sections, and the track was extended as far as Palmer Head. Breaker Bay, 1002. F.G.Barker photo. Tanner Bros. Maoriland Series. Tourist Series 361. Frank Duncan & Co.
New Zealand Photo History Sites.